The Visit - Who Keeps Giving Money to M. Night Shyamalan? Directed and written by M. Night Shyamalan. Produced by Marc Bienstock, Jason Blum, and M. Night Shyamalan. September 11, 2015. Audiences have an odd fascination with M. Night Shyamalan, a director who's only directed one truly great film in his career (Unbreakable), and has followed it up with a series of bad-to-mediocre-to-hilarious entries in the decade and a half that followed. But because he fooled us once with The Sixth Sense - an okay movie that is only memorable for its twist; you know the one - and because we want to be properly fooled again, each time he releases a new film, we start hoping that "this will be the one." This will be the one that marks his return to prominence. This will be the one that re-establishes him as a director to watch. This will be the one that ensures the studios will stop trying to hide his name from trailers, since the audience will no longer feel the need to laugh upon seeing it. The Visit is M. Night Shyamalan's newest movie. It sees a couple of children, Rebecca (Olivia DeJonge) and Tyler (Ed Oxenbould), go to the house of their grandparents, whom they'd never before seen, for a week. Their mother (Kathryn Hahn) left home at a young age and hadn't spoken to her parents for years, but now they want to meet her children, so a trip is arranged. Rebecca has decided to become a filmmaker, documenting the entire trip with a couple of video cameras. As such, the trip is presented to the audience in found footage. The children's visit to their grandparents' house begins fine, but soon enough they begin to notice things are a little weird. Nana (Deanna Dunagan), for instance, suffers from fits at night which see her run around the house, claw at doors, and essentially act like she's possessed. And Pop-Pop (Peter McRobbie) seems to be hiding things in a barn, and may be suffering from some sort of dementia. The grandparents always seem to have a logical explanation prepared when the children question their strange behavior. What's going on? Is it just a case of old people being odd? Or is there something more sinister afoot? 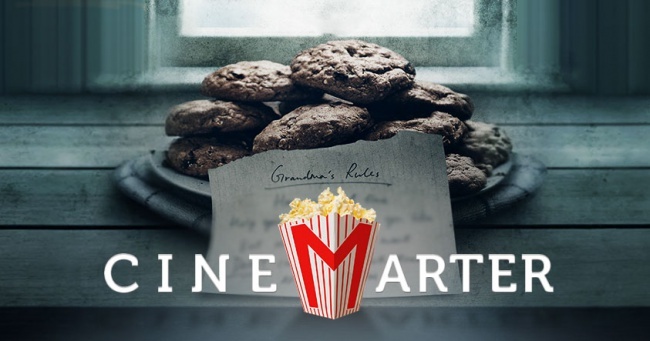 Shyamalan hopes that we'll be so fascinated by the grandparents that we'll be asking these questions, that we'll be fooled by every red herring, and that the twist - because there is a twist - will seem so shocking that it'll make The Visit memorable, captivating, and scary. It is a horror movie, after all, and given the amount of jump startles packed into a relatively tight running time, you're not going to forget that. Unfortunately, the first three quarters of the movie often attempt to be quite funny, and as such, when The Visit wants to be a real horror movie, there's a great amount of tonal whiplash. It's almost as if Shyamalan wanted to make a high satire of found footage horror movies, but then chickened out at the end in order to throw in a twist, turning what didn't work but at least felt different into something that doesn't work and feels generic.